Flying home today, my heart and the hearts of my fellow Holy Land Seminarian pilgrims are full. We have been on a journey of a lifetime together this past month: a blessed opportunity to learn more about the Lord Jesus by visiting the places he called home and in which he accomplished our salvation. We saw so much and had many new encounters; with God, with the Holy Sites, and with each other. I joke that being in the Holy Land was like walking around in the Bible, but in some sense, it really was. Throughout the week there has been one nagging problem on my mind, though, a dilemma of sorts. It was this: I didn’t know how we were going to possibly share the Holy Land experiences and graces with our family and friends when we arrived back home. The dilemma truly was heavy on my mind! After all, one purpose for investing in and sending seminarians on pilgrimage is to enrich our preaching as future homilists; in other words, we’re supposed to come home and share the graces God gave us. If we can’t do that, perhaps the ‘mission’ failed. As I have been praying, though, I have realized that the mission didn’t fail. I found the answer to my dilemma right in the Scriptures. I remember the morning we landed in the Holy Land. That Thursday morning, following an all-night flight, we were very tired but also excited and anxious. We drove to Jerusalem, dropped our luggage, and walked two miles to the Church of the Holy Sepulchre, the site of Calvary and the tomb of the Lord. Coming around the dark but sun-lit corners of the Church, I remember the unbelievable feeling, almost of relief, of seeing the tomb for the first time. I mean, there it was, right in front of me. That place—this place—that changed the whole world, that changed my own life, and gave my life its purpose and direction. It was because of my encounter with the tomb through the Bible that I remember giving my life to Christ when I was sixteen years old. So, there I was, actually in front of the tomb in Jerusalem. I pulled out my Bible, turned to John 20, and read out-loud, “Then the other disciple, who had reached the tomb first, also went in, and he saw and believed...” As I read those words, leaning against a cold, ancient church pillar, I began to weep. Because I, too, was looking into the same empty tomb that John walked into 2,000 years ago. The answer to my dilemma became clearer as I looked at some of the responses of the first Pilgrims to the empty tomb, like St. John. Why did John so eagerly and so anxiously run to the tomb that morning? Was it only to confirm Mary Magdalene’s reaction that someone must have stolen the body of their rabbi from his grave? No, one doesn’t go looking for the living among the dead: John didn’t go to the tomb because he thought Jesus’s body had been stolen. I think deep down in the core of his being John was hoping ‘beyond hope,’ for the things his heart and every human heart long for. He wanted to know without a doubt that his life was infinitely meaningful, to confirm God the Father in Heaven definitively loved him, and no matter what sadness, fears, or even death itself may seem to threaten, his life (and his death) belonged to God alone. He wanted to confirm the impossible: the crucified one was alive, for good. He saw and believed. On our pilgrimage, we saw and did many things. We sang ‘Ave Maria’ with Gabriel in Our Lady’s home in Nazareth. We welcomed Jesus at the place of his Nativity in the cave. We sang ‘Gloria in Excelsis Deo’ in the Shepard’s field outside of Bethlehem. We heard the Father’s voice at Jesus’s baptism in the Jordan River. We learned from Jesus as he preached on the Mt. of Beatitudes. We ‘put out into the deep’ as we crossed the Sea of Galilee near Capernaum. We saw Lazarus’ empty tomb in Bethany. We wept with and kept watch with Jesus in the Garden of Gethsemane. We celebrated the Passover on Holy Thursday, and we wept with Mary and John at Calvary as Jesus hung on the cross with the weight of all sin on his shoulders. And on Easter morning, we saw the tomb. It was empty at first, but only for a time. It was occupied once again on one morning when we were gathered together inside the tomb for Mass. The occupant of the tomb that morning was not, however, the cold, dead body of a crucified Nazarene. The body was the Body, Blood, Soul and Divinity of the risen and living Son of God, Jesus Christ, sacramentally made present before us on the very stone slab where he himself conquered death and was victorious on the first Easter morning. And so, the answer to my dilemma of how and what to share has been solved. How do we adequately share our Holy Land pilgrimage? After all, it wasn’t about merely having another religious or emotional experience. It wasn’t about ‘personal discovery’ or having the thrill of a fun adventure. No, the purpose was about Jesus. When asked, we will just point to him, and testify to the Gospel events that we ourselves saw in the Holy Land, in order to bring others to faith in Christ, that they may believe in Jesus and follow him, either for the first time ever, or in a deeper, more sincere way than ever before. Like the first Holy Land Pilgrims, we return home to testify to Jesus and to invite others to know him, to see, and to believe, just as John did, and just as we have. 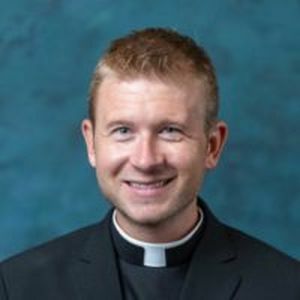 Ryan Eggenberger is a graduate Seminarian for the Archdiocese of Detroit.